1. Sigma Mrs Bunny Essential Kit - I have lost count of how many times this kit has appeared in my wishlists. I don't even want to splurge on other brush kits. It has to be this or no other! 2. Juicy Couture Viva La Juicy Noir - I adore Juicy Couture perfume bottles, all their sweet scents are not up my alley but when I read about this new release Noir it sounded like something which I'd love to own, more for the bottle, less for the scent though haha. 3. ASOS Embellished Cat Eye Sunglasses - The days have gotten cloudy, we don't see the sun so much any more still my wanting for these embellished sunnies have not ended. 5. Tabletop Spinning Cosmetic Organiser by Lori Greiner - I once saw it on letmakeitup1's vanity and I knew I wanted this. Unfortunately it is not available in Germany and shipping for this could be slightly pricier than normal. 6. Mango Ornamented Jacket - I have blazers and cropped jackets in almost every colour than black. I WANT black! This ornamented jacket looks so chic. 7. Mango Mixed Patterns Maxi Dress - I have never come upon a maxi dress that is a perfect style for me until this elegant piece flashed on my laptop screen and it was instant love. If I have to treat myslef to a birthday gift, I'd give me this. Did anything from my Birthday Wishlist tickle your fancy? 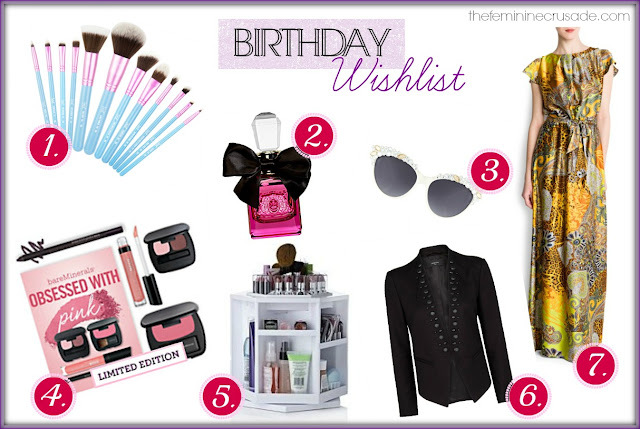 Don't forget to enter my Birthday Giveaway here!